American Pit Bull Terriers the way they were meant to be. All of the dogs on this website are 100 % line-bred Colby dogs. These are the dogs of legend; the icons of the breed and how the dogs were meant to appear. They are the oldest and purest bloodline of purebred APBT's in the world today. 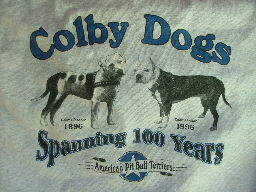 The Colby line of dogs was started in 1889 by John P. Colby of Newburyport, MA. He utilized some of the best dogs available at the time from Ireland and England to create his strain which remains unchanged today. Although he died at the beginning of WWII, the kennel was maintained by his wife and daughter-in-law. When he returned from his tour of duty, son Louis picked up where his father left off and the rest as "they" say is history. Colby dogs come in a variety of color morphs (brindle, buckskin, red and heavy white) but DO NOT come in red-nose, blue or any other modern colors that have been developed. This line is truly a piece of American history and the majority of pure-bred APBT's in the world today can be traced back to the Colby line of dogs. Of all of the "old-school" lines that are available we chose Colby dogs due to their historical value and purity. There are many other renowned lines available, some verifiable, but the majority of the pedigrees are questionable at best. Our goals are to maintain the line in it's purest form so that it can be passed on to another generation of enthusiasts so that they too can enjoy a true piece of Americana and so that we always have a Colby dog in the house. Our dogs are 100% Colby without question and are dual registered with the ADBA and the UKC. We're very proud and honored to have the relationship we have with Lou Colby and to be able to have these dogs available to us.